/ Is Javier Solana the Antichrist? Javier Solana is considered an antichrist candidate by some, including Herb Peters of Fulfilled Prophecy. 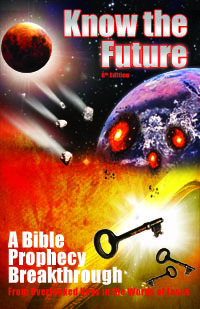 However, the reasons for believing this are not based on the careful consideration of the antichrist prophecies plain meaning but through mostly human reasoning based on Solana's position as the first Secretary General of the European Union, the very body the Antichrist is expected to take control of first. Or as in another site linked below, the highly subjective and contrivable Bible Codes are used to support this. Unfortunately, only applying the Bible for what it plainly says and not ignoring any related scripture that contradicts your conclusion can work. Solana's name does not compute to 666 in the New Testament's Gematria (unless it's artificially manipulated with an strange value system or a contrived transliteration into Hebrew) nor does he fit the depiction of the Beast from the Sea in Revelation 13. After you compare the case for Javier Solana to the case for the other leading Antichrist candidate (from England which Daniel 7 points to as the home country of the Beast), it's much easier to discern this. I recently heard Herb Peters on an interview with Stan Johnson of the Prophecy Club. He was explaining how to him Solana fits Revelation 13's requirement of "the number of his name" being 666. He said that according to Strong's, the word for "name" (onoma #3686) can also mean "authority of" (just as praying in "the name of Jesus" signifies praying by the authority he has and grants us). He argued that since Solano's "authority" to rule comes from Recommendation 666 of the Western European Union, that this could fulfill the 666 requirement. Revelation 13:18 (ESV) — This calls for wisdom: let the one who has understanding calculate the number of the beast, for it is the number of a man, and his number is 666. I did not hear Herb Peters address this verse (nor do I care to if it means enduring another dubious retranslation using Strong's!). When you put this plain verse together with the previous plain verse mentioning it is the "number of his name" it seems inescapable that 666 is to be derived from the gematria of the name of the man who is the Antichrist. As mentioned above, I have not seen this worked out for Javier Solana in an uncontrived way.